Yokohama Peated Black is a 6% smoked beer from Yokohama Beer that is part of their winter seasonal line up of draft beers. The recipe calls for peated malt NOT peat from Ireland – who in their right mind would put soil in the beer – though the use of peated malt is increasingly rare as well as smoked malt is more popular among the big breweries. 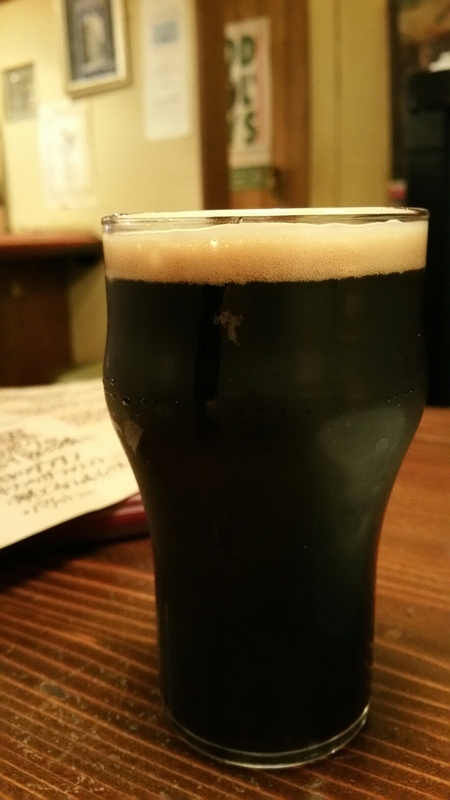 At the time of writing, Yokohama Peated Black is available on draft only with no plans to bring it to bottles in the future. This was the second time I’ve had Yokohama Peated Black with the first being at the Japan Brewers’ Cup back in 2015. At the time, I thought it was a brave idea to try something different in achieving a smoked flavour in beer but it was too heavy on the flavours. I was hoping for a change after two years of waiting. The body poured out an opaque black with no discerning lighter colours. The head though was far lighter than I had expected for such a dark beer, while also having a slightly creamy texture to it. The aroma though hadn’t changed from two years ago – I still remember that acrid harshness it left on the nose when it had warmed up. I guess it must be an acquired taste as the beer is made year-after-year. There was a slight hint of chocolate and some coffee but not by much. With the body, the best way to describe Yokohama Peated Black would be a coffee whisky with an extra peaty dose of flavour added. Then some more added too. After reading about the problems with using peated malt, that is the dominant smokiness coming through, it seems that this beer had the same problems. The smoke flavour was just too strong for it to be a gulping beer. It was a definite sipper and lasted me about 45 minutes as the peat flavour never rescinded. It’s really hard to like Yokohama Peated Black with its dominant smokiness to it. Hopefully it will get turned down a bit in the future.